Should We Lift “Holy Hands” When We Pray? Prayer should be offered only to deity (Mt. 6:9), never to mere human beings (e.g., Mary or “the saints”). This mode of communication is one of those spiritual blessings that is a part of the “in Christ” relationship (Eph. 1:3; Jn. 15:7; cf. Rom. 6:3-4; Gal. 3:26-27). It thus is a Christian privilege. There is no New Testament authority for the sinner to pray for salvation. Prayers should be confidently and persistently offered (Jas. 1:5-8; 1 Thes. 5:17), and in harmony with the revealed will of God (1 Jn. 5:14). These and other elements are components of acceptable petitions to the Lord. A specific physical posture has never been a requirement for acceptable prayer. Prayer can be made standing (1 Sam. 1:26), or kneeling (1 Kgs. 8:54). Sometimes petitions were offered from a prostrate position (1 Kgs. 18:42; Mk. 14:35). One might spread out his hands in prayer (1 Kgs. 8:22; Isa. 1:15) or lift them up (Job. 11:13-14; Psa. 63:4). But neither the place (public or private), nor posture, was a crucial element of the prayer. 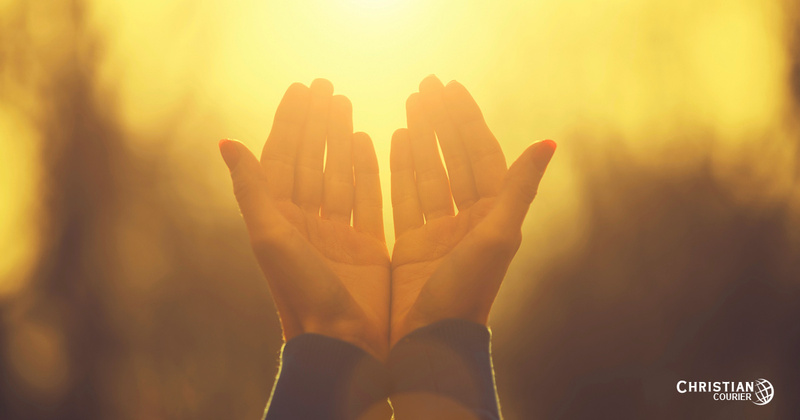 The lifting up of the hands as a gesture in prayer, however, has been a common cultural format in many societies of the past—pagan, Jewish, and Christian. For example, a stone monument with two, uplifted hands (reflecting an act of devotion among the Canaanites) was discovered at the site of ancient Hazor in northern Palestine in 1955. The hand, as an important organ of human activity, becomes a significant symbol in biblical literature. The expression “Jehovah’s hand” signifies the Lord’s power (Isa. 59:1; cf. Acts 4:28). “Hands that shed innocent blood” (Prov. 6:17) represent murderous people, etc. So, similarly, lifting up holy hands (1 Tim. 2:8) is a figure of speech which emphasizes that effective prayer must be accompanied by a consecrated life — a life devoted to the service of God. The passage doesn’t require the lifting of one’s hands when he or she prays. Is There Anything Wrong With Lifting Hands in Prayer? Is there anything intrinsically wrong with holding up one’s hands when in prayer? No, there is not. The lifting of the hands is neither demanded, nor forbidden. If I might, however, I would like to offer what is strictly my opinion about this issue. One might give some consideration to the impression he leaves when he dramatically alters his mode of conduct in public prayer. Will others perceive that there could be a change of doctrinal conviction in some regard? Is it not the common perception, for example, that this type of display is often associated with the “Pentecostal” or “charismatic” phenomenon? Some appear to think that changes of this kind will provide some extra “charge” to their spiritual lives. But spiritual enhancements come from an assimilation of the word of God internally, not as a result of an external alteration of bodily movements. Might such a demonstration be construed as somewhat ostentatious in our present culture? Think about this. There is nothing inherently sinful in “smiting one’s chest” (cf. Lk. 18:13) when he prays, but that might not be the most expedient thing to do in a public setting. Again, as noted earlier, there is no sin in falling upon the ground in prayer (Mk. 14:35), but would such be wise in a public setting? One must remember that perception on the part of others, and the exercise of good judgment, is an important element in Christian conduct. The spiritual person should take these various factors into consideration in making decisions regarding public postures in prayer. Are Christians Required to “Lift Up Holy Hands”?